Looking for lunch on Main Street? 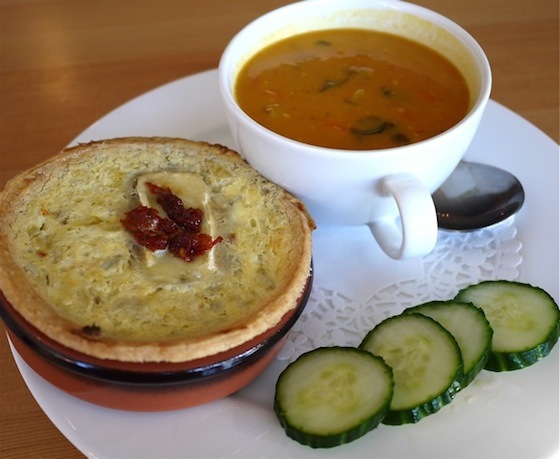 Trafiq Cafe has soup, sandwiches, fresh baking, and more. If you know your baked goods in this city, chances are you’ve heard of it. West Van locals most likely have; it’s going on eight years in their neighborhood. So popular is the baking at Trafiq Cafe that owner Sergio Salamonovitz has opened a second location on Main Street. With a buzzing commercial kitchen at rear, the snacks up front are nothing but fresh. Don’t let the Saran Wrapped sandwiches fool you. Nothing is day old, I was assured. The drizzly day coaxed me towards a fragrant Thai Coconut Pumpkin Soup, brimming with carrots and tomatoes. Hot Artichoke and Brie Quiche as a main was creamy and filling with an airy light crust. This paired with a Sea to Sky Organic Coffee misto and a fantastic Walnut Coffee Cake I was toasty. Perhaps you should nurture the love in today’s air by a chilly walk ending over a steaming menu item at Trafiq? Happy Valentine’s Day everyone!